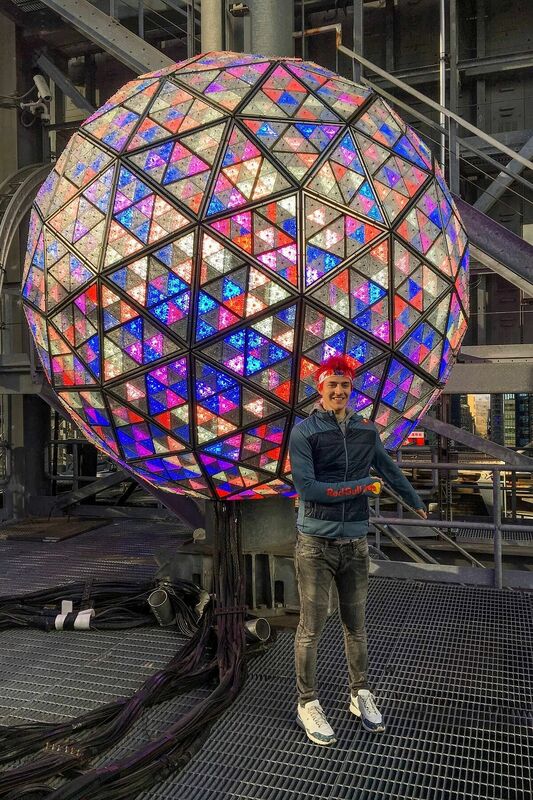 NEW YORK (REUTERS) - Thousands of hardy merrymakers, many in plastic ponchos, watched on Monday (Dec 31) as the shimmering New Year's Eve ball was raised high above a rainy Times Square, hours ahead of its annual midnight descent, a New York City tradition for more than a century. Christina Aguilera, New Kids on the Block and Sting were among the musical performers slated to entertain the throngs filling the plaza formed by the intersection of Broadway and Seventh Avenue in midtown Manhattan. A steady rain, forecast to last for the rest of the evening, failed to dampen the spirits of the assembled multitudes, many of whom donned colorful, oversized top hats handed out by organizers. "It was a bucket-list thing," said Daniela Ramous, a 34-year-old sales manager from McAllen, Texas. "You grow up watching it on TV, you see all the excitement. There's something magical about New York during this time of year." This year, the Times Square Alliance, the business association that organises the event, is paying a special tribute to press freedom as part of the festivities, after a year in which journalists have come under attack around the world, including in the United States. A minute before midnight, journalists, including from ABC News, NBC News, the Washington Post, Reuters and other outlets, will join Mayor Bill de Blasio in pushing the button to initiate the ball drop. "You have to come here in person," she said before applying lipstick and asking a stranger to take her picture on her cellphone. "Especially when you live by yourself. You come, you meet people." Janette Masson, 29, said she preferred this year's rain to last year's bone-chilling cold. Masson, who works in retail in Boston, had been in her pen since 9.30am, eating granola bars for lunch and dinner. "I can deal with it," said Masson's 61-year-old mother, Judy Masson, as she stood in the rain with many hours of waiting still to come. "You make the best of a bad thing." Umbrellas were banned as part of the tight security plan, police said, reflecting concern over the possibility of random attacks. That did not faze the huddled masses in Times Square. "My boyfriend's coming and he's bringing us garbage bags, so we'll put those over ourselves," said 21-year-old Annika Clary, a dancer from Vancouver, Canada, who was counting down to 2019 with her sister. Plastic ponchos were allowed, with street vendors selling them for US$5 on nearby avenues. The current ball, in use since 2008, is a glittering, LED-studded sphere made by Waterford Crystal and Philips Lighting. Weighing 11,875 pounds (5,386kg) and measuring 12 feet (3.7m) in diameter, it sits year-round on the roof of One Times Square, the one-time headquarters of the New York Times. The New York Police Department screened people entering the corrals, deployed sharpshooters on rooftops and used radiation detectors throughout the event. It also had planned to use an aerial drone for the first time to monitor the crowds, but cancelled the effort on Monday evening given the wind and rain. The organisers chose to honour press freedom and the contribution of journalists partly because of the deadly hostility that some reporters have faced this year. Jamal Khashoggi, a Saudi columnist for the Washington Post and US resident, was killed inside a Saudi Arabian consulate in Turkey. In June, a gunman shot dead five employees of The Capital, a newspaper in Annapolis, Maryland.